Monday, February 16, 2015 – Carnevale di Venezia – Doors open 5 PM – Dinner 6 PM. 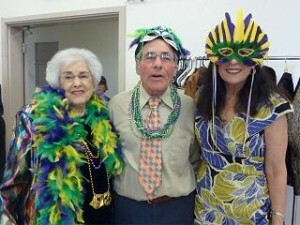 Come to the annual Carnevale celebration at St. Rose Parish Hall, 398 10th Street, Santa Rosa. A special event with entertainment by Due Zighi Baci with special guest bassist Stephen Tamborski. Join your friends & family for an evening of great food, entertainment and dancing. For more information about the entertainment, click here. Dinner menu will feature antipasti platter with bread, risotto con barolo, roast beef, broccoli, salad and dessert. Costume & mask optional. Raffle with many wonderful prizes. $18 members, $20 guests, $8 teens 13-18, $5 children 5-12, under 5 free. See current newsletter Mosaico Culturale for dinner reservation form – prepaid reservations only … must be received by February 7, 2015. This entry was posted in Events, Monthly Dinners on January 22, 2015 by Don Raimondi. Monday, January 19, 5:00 pm – Monthly Dinner at St. Rose Parish Hall Dining Room, 398 10th Street, Santa Rosa. Our January dinner is our annual Board Installation dinner. Come and meet your new Board of Directors and enjoy a hearty winter repast. The January menu highlights the region of Valle D’Aosta: antipasti, polenta with pork stufato, green salad, bread and dessert. A 50/50 raffle is planned. Doors open at 5:00 – Dinner at 6:00. Prepaid reservations only must be received by January 15. This entry was posted in Events, Monthly Dinners on January 12, 2015 by Don Raimondi. The Mosaico January-February Newsletter is available. Click here to review and print the current newsletter. For past newsletters and instructions on printing the newsletter, go to the Newsletter page. Upcoming events described in the Mosaico. This entry was posted in Fund Raisers, Informational Meetings, Monthly Dinners, Newsletters, Sundays at the Center on January 5, 2015 by Don Raimondi.